The thing is, I really like my name. Taylor Ellwood. Pretty easy to remember, not too many other people with the same name and even the other people with that name aren’t writing books or doing anything else along those lines. And I thought having a pen name and trying to explain the pen name and still link it to me seems like a lot more work than I want to do., especially when I’m already in the process of launching the fiction and the brand with it. When you already have recognition, even if it’s for something different, and you know there could be some crossover, you’ve got to explore carefully what you’ll do to get awareness out to your audience, and what changes you’ll make or not make to your marketing presence. I think pen names are valid and I had a pretty cool pen name picked out, but when you’ve already got a bit of a presence out there, why not use what you got, especially if there is a crossover of sorts with your audience? So I did what I always do, when I have a question like this. I consulted the readers of my non-fiction, my community, and asked them if they thought I should stick with my real name or use a pen name. My thinking on that is they’re likely to at least consider becoming readers of my fiction. I also find that tapping into the feelings and thoughts of your community is a good practice for learning what they really want and what matters to them. And make no mistake, when you want to go pro with your writing, you have to be in touch with the pulse of your community, not enough to dictate what you’ll write, but enough to keep you grounded and aware of what they need from you and how best you can show them you’re aware of them. The overwhelming response I got was use your real name with your fiction and non-fiction. And I checked in with myself (because you always, always, always check in with yourself) and it felt right that I should use my real name instead of a pen name. So here I am using my real name with my fiction, as well as my non-fiction. 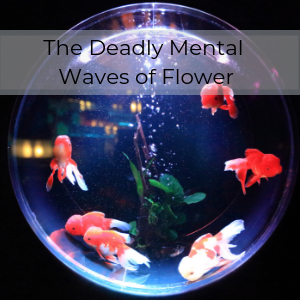 Speaking of which, if you’d like to read some of my fiction, get my free story The Deadly Mental Waves of Flower.